problem than the individual advantages it gives them — and finding a set of reforms that will on balance reduce the frustrations without cutting too deep into individual influence. I’m with Jonathan on this. There are two almost insurmountable problems here. The first is that the American public is simply never going to get excited about internal Senate procedures. It’s true that movement conservatives have shown an impressive ability to work their troops into a frenzy over some pretty peculiar things (repealing the 17th amendment, anyone? ), but their more recondite issues still rarely manage to catch fire with more than a small fraction of the public. And that’s best case. There are hot buttons that can be turned into mass movements, but dissatisfaction with Senate rules isn’t one of them. Second, even if, against all odds, you managed to get the public riled up over this, it’s always going to be intensely partisan. The party out of power will always view the Senate rules as their last bulwark against incipient tyranny, and as long as this remains a partisan issue it has no chance of changing based on public outcry. No, there’s only one way that the filibuster or any of the Senate’s other non-majoritarian rules will be changed: if Joe Biden and 51 Democrats decide to change them in January 2011. When the Senate reconvenes, Biden (and, implicitly, his boss) have to agree to make the required parliamentary rulings, the same way Nelson Rockefeller did in 1975, and a majority of the Senate would have to support him. In particular, Biden would have to rule that each new Senate draws up its own rules, and 51 Democrats would then have to approve changes to the existing rules. And since Democrats are likely to have a fairly thin majority next year, this means that practically the entire Democratic caucus would have to support change. Is this feasible? It’s hard to say since Obama hasn’t said anything one way or the other about it. 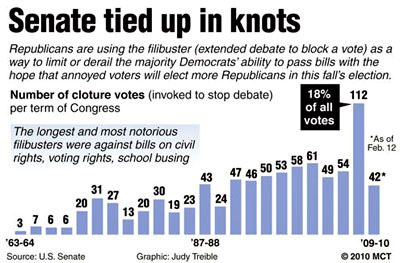 But even if he’s willing, my guess is that there isn’t enough support to change the filibuster rule. However, I wonder if there would be support for at least modifying the rules on holds and appointments? The abuse of holds and the obstruction of Obama’s executive branch nominees has been brazen enough that there might be enough support to rein them in. But I’m not even sure of that.